The moment Dr. Rosalind Franklin learns that she has received a grant to lead a genetics research team at Kings College, she makes three requests in writing: a cube, a camera and the date of delivery so that she may begin her work at once. From that declaration in December 1951 through the course of Anna Zielger’s insightful Court Theatre production of “Photograph 51,” directed by Vanessa Stalling, Chaon Cross delivers an exhilarating and flawless performance as Franklin, the British chemist whose groundbreaking work in the male-dominated world of scientific research provided the key to our understanding of DNA’s molecular structure. Upon arrival at the Kings College research laboratory, Franklin discovers that the brash Dr. Maurice Wilkins (Nathan Hosner) has a completely different perception of their professional association creating an intolerable – and what we would today call ‘toxic’ – work environment. Undaunted, Franklin forges an alliance with her research assistant Ray Gosliing (Gabriel Ruiz) to refine the X-ray technology to photograph the shape and pattern of DNA. As successive images become more illuminating, word leaks to James Watson (Alec Goodrich) and Francis Chick (Nicholas Harazin), a competitive team of scientists at the University of Cambridge. Along the way, Franklin corresponds with Don Casper (Yousof Sultani), a doctoral student who vies for a fellowship to work alongside Franklin. It is around the reflections of all of these men that the portrait of Franklin’s life emerges. The injustice defined in “Photograph 51” involves sexism, deception, greed and unethical behavior, all tinged with anti-Semitism. As she feels progressively more suffocated by the hierarchy in the post-war scientific research community, Franklin’s only recourse is to isolate herself. With only a few steps left in her research, a pair of fresh eyes – three pairs, actually – obtain key information and are able to break the code ahead of her. Without an earnest ally in the group, Franklin’s significant contributions are obscured and marginalized. This compelling story unfolds through the voices of the men, all superbly cast, recalling pivotal scenes with Franklin, and among themselves, presented in rapid succession over a span of roughly 18 months into mid-1953. The narratives, according to the fine program notes by Production Dramaturg Derek Matson, are rooted in the contrasting view of Franklin’s work first addressed in James Watson’s controversial 1968 memoir The Double Helix, which compelled other works, all represented here, and Maurice Wilkins own account in which he accepts responsibility for minimizing Franklin’s contributions when he, with Crick and Wilkins, received the 1962 Nobel Prize for Physiology for the discovery. Arnel Sancianco’s arresting scenic design includes a massive, two-story wall framed with definitive circular stairs on either side while the laboratory’s main floor has period card catalogs, lab tables and equipment on an ingenious floor design. It is all integrated with Keith Parham’s superb illumination, Jeffrey Levin’s stirring sound, stunning projections by Paul Deziel and Mieka van der Ploeg’s impeccable costumes. “Photograph 51” is an empowering statement about equality, perseverance and truth. 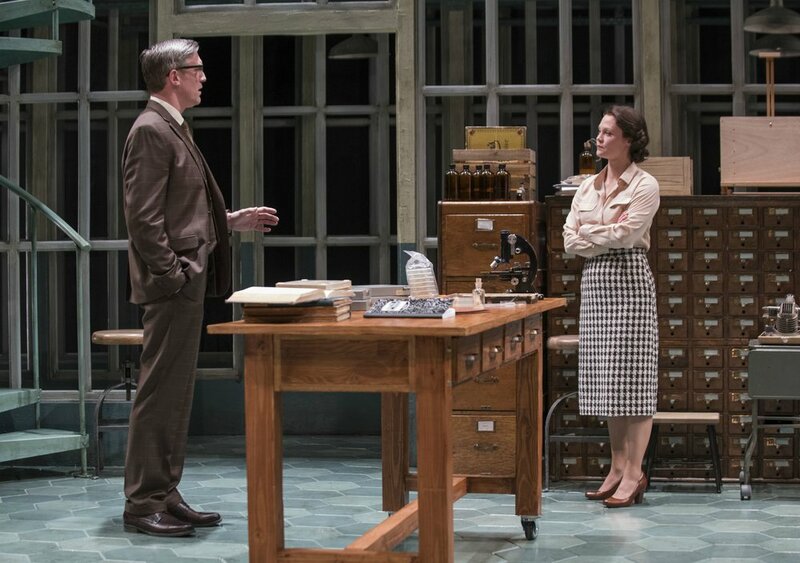 While “the world wins,” the moving and heartfelt performance of Chaon Cross reveals Franklin as a complex, compassionate, driven chemist with an extraordinary thirst for knowledge. Most importantly, as art and science intersect, Rosalind Franklin’s rightful place as a trailblazer is assured.